This tutorial will walk you through creating a basic application containing Tree. You will learn how to initialize a Tree, populate it with data and set the desired configuration. The final code of the tutorial can be used as the start point while creating applications using Tree. To start, create a new HTML file and include the related Webix code files in it. 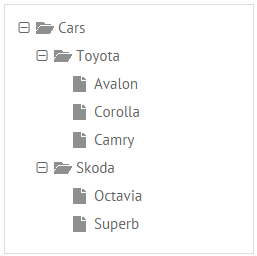 After you have included the necessary files, you can move to Tree initialization. In fact, it's enough to initialize a Tree. However, it's also possible to put a tree inside of an HTML container. There are different ways to load data into Tree (read about them in chapter Loading Data into Tree ). Congratulations! Now you can run your app and it'll produce Tree shown at the very beginning. Sorting in Tree and Filtering in Tree - says about means for sorting and filtering. What can we suggest you to do next?